MIKA HAKKINEN drove a marvellous early stint in the San Marino Grand Prix, matching Michael Schumacher tenth for tenth, edging gradually away and he looked to be on course for a victory and then - with the flick of a wrist -Schumacher turned the situation around. Everyone shook their heads. How had he done that one? Three races, three wins. It is not the end of the story yet but not even McLaren can afford to give Schumacher a 24 point lead in the World Championship. Sometimes one forgets how long we have been coming to Imola because, alongside the grand old lady Monza, the Autodromo Ferrari still seems to be a new kid on the Formula 1 block. But this is the 20th year that the track has hosted a World Championship event and, in the quirky little family-run hotels in the region, all the gawky little girls who used to be children have grown up to become anything but gawky. And the boys have grown up to adopt the local look, which always suggests that the United Nations should airlift in emergency supplies of razor blades. The best selling items in the region are sunglasses, Ferrari hats and spaghetti. Nearby Bologna is a town famous for its sucking noises and every year miles and miles and miles and miles of spaghetti disappear into the locals, accompanied by the Bolognese sauce that has made the town famous. Just up the road at Pedrignano the Barilla factory turns 40 truck loads of wheat into pasta every 24 hours. It is the largest pasta factory in the world and employees are given bicycles to get from one end to the other. One of the joys of visiting Imola is the food. And then there is the wine which is so pure that you don't get hangovers. The hills are beautiful and the weather is usually good. Hell, Imola is a great place to be whether you are a racing fan or not. The thousands of Ferrari fans may block up all the roads trying to get into the autodromo but you cannot go to Imola without getting excited about Formula 1. This year the race was three weeks earlier than normal and there was a bite in the air in the mornings but otherwise it was business as usual. Like all great race tracks (Imola is not as good as once it was because of a blight of chicanes) one goes there with a mixture of different sentiments. There have been good times and bad times. Magic and tragedy. Those who remember back into history will recall the day, in 1983, that Patrick Tambay drove Ferrari number 27 to victory at the track, a year after his friend Gilles Villeneuve had been robbed of the race by his Ferrari team mate Didier Pironi. Villeneuve went to the next race, in Belgium, intent on beating Pironi. He took one risk too many and died. Tambay still remembers that day as almost a religious experience, as if there was someone else with him in the cockpit that day. It was at Imola that Gerhard Berger was magically extracted from a fiery wreck in 1989 with no major injuries. But there have been the dark days too and Imola will forever be the place where Ayrton Senna died on an evil weekend in 1994, which also claimed the life of Roland Ratzenberger. Oddly enough, after Tambay's win in 1983, Ferrari did not win again at Imola until last year when Mika Hakkinen was leading when he smacked his McLaren into the wall opposite the pits. In the 15 years between the two Ferrari victories Williams won seven times, McLaren took six victories and Lotus and Benetton took one apiece. Today, however, the conventional logic is that Ferrari is competitive and even if the Ferrari car is not as quick as the McLaren in qualifying it is more reliable and so Ferrari arrived at Imola this year with a monstrous 26 point lead in the Constructors' title with Schumacher having scored the maximum possible in the first two races. Friday is always a TV day and so it was no surprise to see the Ferrari boys 1-2 at the end of it. On Saturday there was the usual reality check as Mika Hakkinen blasted Schumacher aside with a magnificent last-minute dash to the flag, after the German had sneaked pole by a hint of a couple of hundredths with less than a minute to go. But the McLarens were out and running and Hakkinen did the job as he so often does when the chips are down and his back is to the wall. It was a brilliant qualifying and the crowds were going up and down like yo-yos on heat. Hakkinen was happy. "I was on the absolute limit during my final run," he said. "I really pushed." The tire situation was quite interesting as it appeared that Hakkinen was the only one of the top four drivers to use the softer tires, while Schumacher, Coulthard and Barrichello were reported to be on the medium tires. Michael Schumacher said he was disappointed and went through the usual "I could have been a contender" routine. The problem these days is that the atmosphere of mistrust in the paddock is such that one cannot be sure whether Michael was putting on a theatrical display to create the right impression or whether the car was really capable of pole position. The one thing you do know is that with Hakkinen one never has such worries because he is incapable of acting. With Michael you just never know. "I am very upset with myself because I made a bad mistake at Rivazza on my third run," he said. "I was four-tenths up. I could easily have been on pole today." On this occasion there is no doubt that Michael did blow it and at a track where overtaking is very tough - as was shown in the Formula 3000 race on Saturday - his failure to get pole position was a major setback. Schumacher is not supposed to make mistakes like that. Hakkinen rarely does in qualifying (which is why he has 24 pole positions to his name). David Coulthard was also disappointed and said that he too had made a mistake at Rivazza. In the end he had to settle for third place on the grid, just three-tenths slower than Hakkinen's pole position. The F1 teams have all developed PR strategies which insist that any official remark must be as positive as possible and so one becomes used to reading things like: "I am very disappointed to have gone end over end and destroyed my car but I feel that in the spare we have a good chance to win the race tomorrow from 22nd of the grid." And thus it was with Schumacher and Coulthard. Barrichello too did not make the most of his Ferrari. He was half a second slower than pole after struggling with the balance of the car. He also had to lift off for a yellow flag on his fastest lap but he said he was "not worried about the race because the team is capable of solving the set-up problems". The top four are not really in much need of so much positive thinking as they are very comfortably ahead of the rest of the field which was led on this occasion by Ralf Schumacher in his soft-tire shod Williams-BMW. Ralf needed a bit of a boost after his image as the bright young kid of F1 was dented in Brazil by Jenson Button's impressive performance. This time Jenson was struggling. He chose the harder tires but his major problem was getting to know Imola and to force himself to drive over curbs, something he has never liked to do. "I am not quite where I wanted to be," he said. "I have found it very difficult to get familiar with using the curbs and I must say that I am still not really confident." He was not helped by technical problems which meant he had minimal track time on Saturday and so he ended up 18th. This did not stop the team being quite impressed. "I thought that his first run looked quite strong relative to the lack of mileage he'd had," said Patrick Head, who is not a man given to glowing praise. There were 11 drivers within the same second of Ralf Schumacher and that gives you an indication of the state of F1 at the moment. Behind the two big teams, everything is very close and a blink or a splutter can make the difference between success and failure. The perceived difference between fifth and 16th places was not really deserved. Heinz-Harald Frentzen was sixth quickest in his Jordan and with Jarno Trulli eighth the team was looking rather good, although not as good as it would have wanted given the level of performance at the end of last year and the hopes that there had been for the new car. "It was really tight," said Frentzen, "with everyone fighting for those thousandths of seconds. We could not find that extra time." The Jordans were running on soft tires. Between the two yellow cars was the jolly green Jaguar of Eddie Irvine although things are not very jolly down in the green pit these days. Walk too close to the garage and you can hear the knives being sharpened in preparation for the impending bloodbath. Jackie Stewart was not around for the weekend and one must draw the obvious conclusions from the comment from a Jaguar man that the team was "a tartan-free zone this weekend." On the subject of disasters, Johnny Herbert's 2000 season continued. Either Johnny is the unluckiest driver in the history of the sport since Chris Amon or the Jaguar team is not up to running two cars. As usual Herbert was beset with mechanical trouble and he ended up 17th on the grid. Herbert smiles and says all the right things but one gets the impression that if he was given a chain saw he might do a little pruning of the team structure if given half a chance. Learning the hard way is something which British American Racing is now beginning to get used to and while it might hurt the team bosses (of which there are, of course, still at least one too many) there are signs that things are beginning to meld in the right way and so Jacques Villeneuve (who rumors suggest is already plotting his departure from the team at the end of the year) was not looking too bad in ninth position (a time achieved with soft tires). He lost a lot of time with mechanical trouble on Friday and Saturday morning and said he would have been four or five tenths quicker if he had not been slowed by a yellow flag. Ricardo Zonta went for the medium tires and ended up 14th on the grid, seven-tenths slower than Villeneuve. "I think we made the right decision," he said. Completing the top 10 was the Sauber of Pedro Diniz, showing once again that the size of a wallet is not everything. Over the years Diniz has shown time and time again that he is capable of mixing it with the fast guys and here he was doing it again. He remains gloriously inconsistent and his qualifying included a spin. Mika Salo was 12th on the grid. "I just couldn't get a good lap together," he said. "I kept hitting the curbs too hard which made it very difficult to get the power down which just made worse the traction problem I was having." After the flattering performance in Brazil, Benetton was back in the midfield and looking very average with Alexander Wurz 11th and Giancarlo Fisichella 19th on the grid having used the medium tires. The drivers complained of oversteer, understeer, lack of grip, lack of traction, and just about everything else you can think of. "I really got the maximum I could have got out of the car," said Wurz. The Orange men at Arrows were also less impressive than it has looked on occasion with Pedro de la Rosa 13th on the grid and Jos Verstappen 16th. The Dutchman would have been quicker had he not had a problem a rear wheel on his fastest run. The Prost-Peugeot looked better than the Minardi but that is not really much to write home about given the relative budgets of the two operations. Jean Alesi was 15th on the grid and even Alain Prost admitted that Jean had given the maximum in difficult conditions. Nick Heidfeld was 22nd (and last on the grid) having had to jump into the spare car. Even allowing for this the German has not really impressed the year - either within the team or in the paddock. The Minardi team was happy at Heidfeld's misfortune as this meant they were 20th and 21st on the grid rather than 21st and 22nd as usual. The car is actually quite nice and the major problem is a lack of horsepower. Marc Gene went off on Saturday morning and had to use the spare car in the afternoon and so he ended up behind Gaston Mazzacane. RACE morning suggested that the McLarens were slightly faster than the Ferraris but the crowds did not care. They had come to see the red cars win. At the start Schumacher did not make a good getaway and, in order to defend his position, he swerved across the road to the left into Coulthard's path. It was not subtle. It was very Michael Schumacher. The two tussled for a moment but then David had to lift off for a moment. He lost momentum and so when they arrived at Tamburello Barrichello was on the outside and level with Coulthard. Rubens was not going to give way and so David had to. It was very close. Once that was done David was stuck. End of story. All this had given Hakkinen a good lead and he ended the first lap with 1.2seconds in hand over Schumacher's Ferrari. They were 3.1seconds clear of Barrichello and Coulthard. In those early laps the gap barely budged 1.0sec, 1.0, 1.1, 1.1, 0.9. 1.1 and so on. And then inch by inch Mika began to edge away by a tenth here and a tenth there. By lap 20 he had eased the gap out to 3.0secs. Schumacher could not hold him. The McLaren was faster. Was it the fuel load? Was it the tires? It was impossible to say. On lap 27 Hakkinen stopped to refuel. Schumacher followed him in. When they were back up to speed Hakkinen had an even bigger advantage. 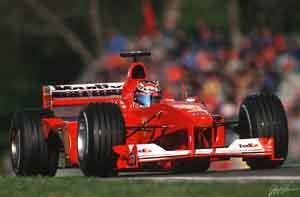 The Ferrari had been at rest for nearly 10secs, Hakkinen's for only 7.6secs. That had to mean that Schumacher had taken on a lot more fuel. That would indicate that he was going for a long middle stint. But the lap times did not show it. A couple of extra seconds worth of fuel at 12 liters pers second is about 25 kgs of extra weight and the men who know these things say that 10kgs means about 0.3sec per lap at Imola. Michael should have been about three-quarters of a second slower every lap. Half a second if you took into account his new tires. But he wasn't. On some laps he was matching the times he had been doing before the stop. On others he was a few tenths slower. As the fuel began to burn off and before the second set of tires started to go away he was able to go a little faster but nothing suggested that he would have enough fuel to have a really quick final pitstop. Hakkinen seemed to have everything under control. The gap was up to five seconds when Mika hit a piece of wreckage and damaged the air-splitter beneath the monocoque. He recovered and began to make up time again and by lap 39 the gap was nearly five seconds once again. And then Schumacher began to close in. On lap 41 - for no apparent reason - the gap came down by a second. Next time around another three-tenths had been chipped away. On lap 43 Schumacher had to deal with Diniz and lost a second as the two of them nearly collided. "Pedro tried to be nice and let me pass but it was the wrong place," Michael said. "I very nearly hit him." But on the same lap Mika was also in trouble. Something in the electronics had gone wrong. Suddenly Mika was without any drive. The system reset itself and he was going again. It had cost him two seconds, Schumacher had clawed back another seven-tenths. On the next lap Mika pitted for a second time. He came out 20 seconds behind Michael. The Ferrari would need at least 25 second to get in and out of the pits and so if Mika could hold that gap he would have the race won. For the next few laps Michael went for it. The lap times were OK, but they were not great. Everything looked to be under control. It was magic. In fact the secret was in the IN and OUT laps and in the pitlane (as it so often is). Michael gained 1.5secs over Hakkinen on the IN lap and a mammoth three seconds on the OUT lap and because he did not need much fuel he was three seconds faster in the pitlane than the McLaren driver had been. As the stops took place at different moments, the gain in time was not obvious until it happened. Even Ron Dennis did not believe it. He shook his head. "Is there somewhere you can cut the corner at this track?" someone said in total bewilderment. What had happened? Schumacher had won the race. The time he had gained had not disappeared. It had just not appeared on the electronic lap charts. Real time and recorded time are different. The McLaren team said it would not have happened if Mika had not had the engine cut out but that was no excuse because Michael had lost almost as much in his incident with Diniz. After that the race was over. Hakkinen finished a second behind but at Imola these days a second is a century. Overtaking after the start is just not an issue. The fans saw a marvellous battle with the best racing cars and the best drivers in the world, but they were running on a really useless circuit. There were only two overtaking maneuvers all afternoon after the startline hurly-burly. Jean Alesi scrambled past Pedro de la Rosa early on and Pedro Diniz nailed Ricardo Zonta on lap 23. The rest of the afternoon was just a question of high-speed queueing. Coulthard's hopes were ruined by the time he was stuck behind Barrichello. He had hoped to get away at the first pit stop but he had a momentary first gear glitch and found himself behind Barrichello again. At his second stop on lap 46 he finally managed to get ahead, thanks to some nifty work by the McLaren boys. After he was ahead of Rubens he pulled out a 38 second gap in the final stint. That said it all. Barrichello was utterly overshadowed by Schumacher all weekend. His explanation was a marvellous piece of mangled English. "All weekend I was not on the pace as I was in Australia and Brazil," he said. So who was the guy walking around the paddock pretending to be Rubens Barrichello? In fifth place but a lap down was Jacques Villeneuve who had driven a very fine race "I got just an amazing start," he said. On the day of his 29th year, the birthday boy jumped from ninth to fifth. To get there Jacques had gone wide to the left, scooting quickly around Irvine and Ralf Schumacher and then, seeing a gap to the right where the two Ferraris had been and where Frentzen ought to have been but was not (because of a poor start). And that meant that he was braking for the first corner behind a Ferrari. After that it was just a question of holding off those on his tail and Jacques did exactly that for the rest of the afternoon. At first it was Trulli, then it was Irvine. After the pitstops it was Ralf Schumacher's Williams and then in the closing laps it was Jacques's pal Salo. Jacques held on and got two well-deserved points. Salo was a gnat's whisker behind at the flag. Zonta had a less successful day. At the end of the first lap the Brazilian was 12th. Just after his first pit stop he suffered an engine problem. He kept going and finished 12th after one trip into a sandtrap. Salo's sixth place was reward for a very fine drive. "It was absolutely flat out all the way," he said. "The trouble was that Jacques is an experienced driver who doesn't make mistakes. There was no way to pass him." Diniz finished eighth, having been a victim of Salo's success at the first corner. He later overshot his pit and lost some time during the pitstops. Seventh place went to Irvine in the Jaguar. It was a start. Eddie spent most of the race fighting with Jarno Trulli's Jordan, initially for sixth place but later (because both were on the wrong strategy) for seventh. Irvine did not help his cause when he pushed the wrong button and managed to apply the pitlane speed limiter in the middle of the race. This enabled both Ralf Schumacher and Salo to hurtle by before Eddie was back up the speed again. It was not quite the flawless performance that Ford's Neil Ressler suggested, but it was better than nothing. Herbert also managed to finish but 10th place was not great. Johnny had decided to go for a one-stop race which was not the way to go. Benetton's day is best glossed over quickly. The team decided to go for a one-stop strategy all round and that was a major error. Ninth and 11th places were the result. After the good showing in Brazil, this was a hard blow for the team. Of the rest, Jordan had the right to whine a bit. Frentzen went out early on with a gearbox problem while Trulli made a good start to grab sixth place. The strategy of an early first stop did not work out and so by the end Jarno had slipped back to seventh. Four laps from home the car stopped with a gearbox failure. Minardi got one car home although a spin rather blotted Mazzacane's hopes of glory. Marc Gene went off as well but he stayed in the sandtrap. This was caused by oil from Jenson Button's Williams-BMW, which expired in a oily haze early in the race. Ralf Schumacher lost a lot of places at the start and so dropped to ninth, but he later profited from the retirements of Frentzen and Irvine's button-pressing fever and so was seventh in the mid-race. That became sixth thanks to Trulli's strategy and he looked like grabbing fifth from Villeneuve at the second stop but then pulled off with "a fuel pressure problem". He was coming in at the end of that lap so it would not be outrageous to suggest that perhaps there was no fuel left in the tank to create the necessary pressure. Arrows managed to get Verstappen home in 14th but this was nothing to write home about. Verstappen had made a remarkable start, leaping from 16th to 11th. After 11 laps there was a problem with the right front wheel and Jos pitted for a check. Later he was given a stop-go penalty for not getting out of the way of the frontrunners and so he lost more time and ended up three laps behind. Pedro de la Rosa's race was not much better. He lost ground at the start and then ran into gearbox trouble. The adventures of Prost Grand Prix are barely worthy of comment. Heidfeld's car refused to set off on the parade lap. The team then tried to fix the car (illegally) and so when Heidfeld did finally start from the pits he had to come back into the pits for a penalty. Then the hydraulic pressure started to decline and eventually it went so low that everything stopped working. Alesi's race was about as exciting. He was stuck in the midfield surrounded by trolling Benettons but then the hydraulic pressure gremlin gnawed a hole in the system and (guess what?) the car stopped working. There was no Prost magic on this day. Schumacher had it all.